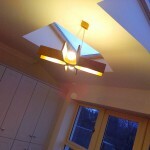 “Well, we finally moved into our new home on Saturday, just in time for Christmas! We are delighted with the space, precipitated by your design of course!!! Then armed with many interior zines and the internet we came up with the rest; colours, materials, lighting etc. 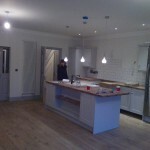 We’re very happy with it and the builders, kitchen guys etc. 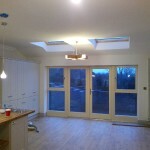 keep saying we have the nicest kitchen/space of all the completed houses so far. I’m not sure if they just say that to all the ladies or if they genuinely mean it, but we’ll take the compliments anyway. Please see attached some hastily taken phone photos just to give you an idea of what it looks like. Anyway, thanks again for your design. We are just delighted with it (See also 14 June 2014 & 02 Feb 2015).